The continuation of the killing of more than 1000 civilians in Syria by dictator Bashar al-Assad must now be answered by innovative actions by the Arab states and the West. Words are not enough anymore, he does not listen to them. The UN Security Council is blocked by the interests of two veto-members: Russia wants to sell more arms to Syria and China block any protest by all means as done in Beijing in 1989, when over 1000 Chinese citizens were killed. Establish a "Syrian Centre for the Registration of Crimes against Humanity" - preferably in The Hague or Istanbul, Geneva or Berlin. Prosecuters can collect evidence of crimes and murder. Victims can report them to the staff. This has been successfully done by the German "Zentrale Erfassungsstelle Salzgitter" which for decades collected 42.000 pieces of evidence of crimes against Germans in the East German dictatorship (GDR). Form a "Free Syrian Parliament in Exile", preferably in Istanbul, which will have representatives from all different ethnic groups, religions and political groups in discussion together. 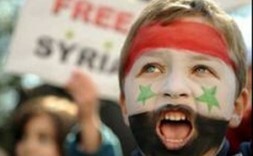 Collect signatures of Syrians to promote this free assembly. This has been done very successfully in Estonia where Tunne Kelam, Member of the International Advisory Board of WSN, and now a member of the EU Parliament, and the freedom heroes of his small Baltic country - which was forced into the USSR in 1940 - established the Congress of Estonia in 1990 where 499 delegates from 31 political parties were represented, including the ruling communists . The permanent standing committee of the Congress of Estonia - the Committee of Estonia (Eesti Komitee) - was chaired by Tunne Kelam. The Free Syrian Parliament as a first step should debate and agree on a modern constitution along the lines of the UN Charter protecting the freedoms of the people and promote religious and ethnic respect and tolerance. In 1945, the founders of the United Nations saw tolerance as a key to the peaceful coexistence of the people of the world. “Tolerance recognizes the universal human rights and fundamental freedom of others”. According to the UN and international law, universal human rights include: Freedom of speech, opinion, the press and religion. Societies like the dictatorship in Syria that disregard these universal human rights present present a threat to their own people as well as other countries, as in Lebanon where the Syrian Secret Service was involved in the killing of President Hariri in 2005. These actions should be funded by the EU and the US and must start soon.